Scott Bryan, Director of Engineering / Environmental, Health & Safety, Sierra Circuits, Inc. Printed Circuit Board manufacturer, Sierra Circuits was looking for a cost-effective way to remove copper and other metals from the Sulfuric Acid used to regenerate ion exchange (IX) columns for PCB Waste Treatment. 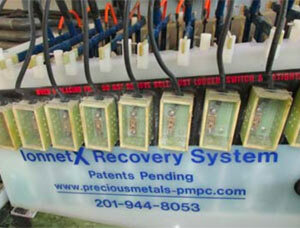 In August of 2014, Sierra Circuits installed an IonnetX™ electrowinning system from Precious Metals Processing Consultants (PMPC). The amount saved is projected to be greater than $80K per year. Sierra Circuits is a quick turn printed circuit board shop located in Sunnyvale, California. We offer a fully-contained wastewater treatment department as part of our environmental, health, and safety department. Inline with our green initiative and our environmental policy of continuous improvement, pollution prevention, and regulatory compliance, we are always looking for methods to reduce cost and waste. This ion exchange system uses a macro-porous polystyrene-based chelating resin, with iminodiacetate groups designed for removal of heavy metals from waste water. 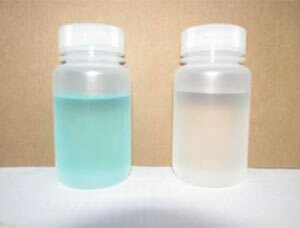 The resin is used in processes for the extraction and recovery of metals. An example of such a resin is the S930Plus from Purolite of Bala Cynwyd, PA. After all the sites of the resin are used, the resin needs to be regenerated using an acid. The acid gets broken down and the hydrogen replaces the metal that is on the resin. The metal is flushed out with the acid and water. Before the IonnetX™ system, Sierra Circuits was removing metal from the acid using a conventional PCB waste treatment system. This involves a batch system that that uses Caustic, Ferrous Sulfate, Sodium Sulfide, and a polymer to form sludge that is pressed into a filter cake. This filter cake sludge is then sent off site for further treatment that typically involves metal recovery, burning, and disposal in a landfill. The curve displayed in Figure 1 is an empirical representation of the copper concentration diminishing as a function of time on a daily basis. This has been repeated each weekday for six months, with slight variation. 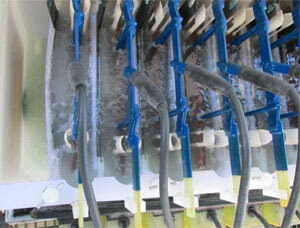 The IonnetX™ system uses electrowinning to remove the copper. 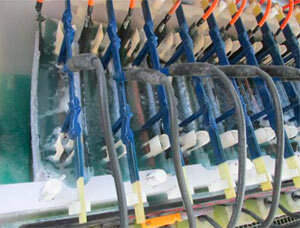 The copper -laden acid solution is pumped through the system and plated onto cathodes that can be sold for scrap metal. 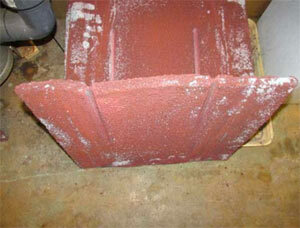 Ferrous Sulfate – 250 lbs. Sodium Sulfide – 15 lbs. Copper filter cake, which no longer is produced – 300 lbs.